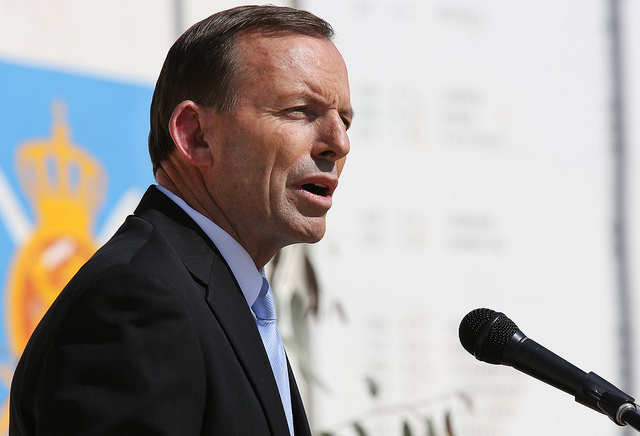 In his words about the argument with China, Tony Abbott quickly scored the trifecta: alliance, interests and values. These are the three things nations go to war for. And within days of China’s announcement on November 23 of its new air defence zone, Abbott had ticked all three boxes. Abbott’s trifecta is striking on many levels, not least because we’re such a long way from anything that should be worth a conflict with China. If the Prime Minister’s framing of the argument is taken at face value, we are not as far from that precipice as we’d like to imagine, easing towards the summer slowdown of the Oz Christmas. The region must work harder to build some kind of architecture where regional powers can discuss security. If such a framework had existed in Europe in 1914, things might have turned out differently. This first of a series of four columns on Abbott’s trifecta will build on my recent efforts on the US alliance and the alliance trilateral with Japan , the iron in the idiom  Abbott injected into his comments on China compared to the softer line that could have been expected from Labor and the John Howard context for Abbott’s embrace of Japan as an ally . I think it’s important for Australia to stand up for its values. We have to be reasonable and proportionate about these things and have to treat other countries and their leaders with respect and with courtesy but where we think Australia’s values and interests have been compromised I think it’s important to speak our mind and we believe in freedom of navigation – navigation of the seas, navigation of the air – and I think there is a significant issue here, and that’s why it was important to call in the Chinese Ambassador and put a point of view to him. Tick the values and interests boxes. Note that in so joining values and interests in the one phrase, Abbott is breaking the rule repeatedly preached by the political master who made him, John Howard. The Howard mantra was always about the need to focus on the interests that united China and Australia, keeping these completely separate from their differing values. The mantra was that interests should bring Australia and China together, while too much about values could drive them apart. China trades with us because it is in China’s interest to trade with us. We have good products, we have good reliability as a supplier, we can supply at competitive prices and I hope that is always the case. I expect China to be a strong and valuable economic partner of ours because it is in China’s interest to be a strong and valuable economic partner of ours. I think China fully understands that on some issues we are going to take a different position to them. We are a strong ally of the United States, we are a strong ally of Japan, we have a very strong view that international disputes should be settled peacefully and in accordance with the rule of law and where we think that is not happening, or it is not happening appropriately, we will speak our mind. I know politicians are going to be judged on everything they say, but sometimes in the heat of discussion you go a little bit further than you would if it was an absolutely calm, considered, prepared, scripted remark. Which is one of the reasons why the statements that need to be taken absolutely as gospel truth are those carefully prepared, scripted remarks. Accepting that old warning from our Prime Minister, the trifecta sentiments do have some gospel-worthy standing. They seem an accurate rendering of Abbott’s previous foreign policy musings. And China, certainly, is taking the sentiments as Abbott gospel and going in hard in response. Let’s accept that Australia’s 28th Prime Minister said what he meant and meant what he said. Indeed, let us assume that this Rhodes scholar, Catholic seminarian, journalist, and writer—now a politician with a superb ability to hone his message to a sharp point—is well aware that words can be bullets. Each element of the trifecta is worthy of its own column; thus, the coming days will produce individual efforts on alliance, interests, and values as they apply to Australia’s relationship with China, the US and Japan. Graeme Dobell is the ASPI journalist fellow. Image courtesy of US Embassy Kabul Afghanistan .